From the intense colours in Emily Kame Kngwarreye’s work to Billy Benn’s subtle palette: ”Show Your Colours” celebrates the bold use of colour in contemporary Aboriginal art. As well as presenting a brilliant explosion of colour it also shows new developments and new art. “Show Your Colours” sheds light on recent developments in Aboriginal art. When the desert art from Central Australia encountered western media in 1971 and mixed with western techniques, acrylic paint provided a much more extensive palette. More so than natural colours and ochres it enabled artists to experiment to the full with colour. This exhibition features a wide range of artists who work in a variety of media (painting, photography, video, sculpture). Special attention is devoted to Julie Dowling’s penetrating and colourful portraits. Dowling’s portraits of family members contain grim undertones of the oppression and neglect of a whole people. In this way she exposes the hidden history of Australia, such as the consequences of colonisation and the ‘stolen generation’. 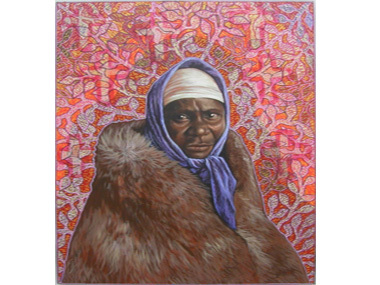 Her work is an intriguing mix of western styles and motifs from traditional Aboriginal painting. In his work “I’m Sorry, It Wasn’t Me” Richard Bell directly criticises the previous Australian government, which refused to apologise for the 'stolen generation'. He also contributes very prominently through his work to the debate about what exactly Aboriginal art is. Australian photographer and filmmaker Tracey Moffatt often refers to her mixed and complex background in her work. Her film ‘Night Cries’, which is set in an artificially coloured studio, can be seen at this exhibition. The collage of three figures and the warm colours of “High Rise” by Kay Hassan evoke the atmosphere of his home country South Africa. Presenting this art work offers, apart from demonstrating affinity in form, an opportunity to place the Aboriginal art on display in a broader perspective. In this exhibition AAMU also presents new additions to its collection: work by a.o. Alma Webou, Sally Gabori and Pulpurru Davies, artists who started to paint quite recently. Moreover It makes room for a young and rapidly rising talent such as Daniel Walbidi. With “Show Your Colours” AAMU aims to stress what the museum is about: showing Aboriginal art to an international audience in a refreshing way, in the context of developments in other contemporary art. “Show Your Colours” can be seen at AAMU from 23 April – 27 September 2009.